In 1981, Ideal released The Missing Link, a challenging mechanical 3D puzzle and a worthy follow-up to its iconic Rubik’s Cube. In fact, the toy’s red-green-yellow-white colour palette and rotational mechanics clearly paid homage to the Rubik’s Cube. Designed and patented by Marvin Glass & Associates, the puzzle had four sides, with each side containing four tiles. When correctly aligned, each side of the puzzle displayed a colour-coded image of an interlocked chain of either two or three links. Once the tiles were scrambled, they could be restored to their original configuration through a combination of actions. In addition to the familiar rotating action, they could also be slid up and down. 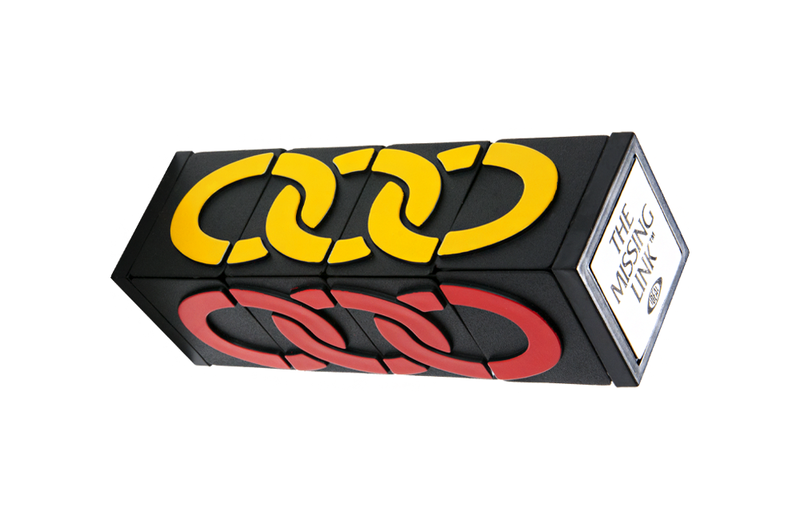 The white chain was made up of only two links and three tiles, providing a gap necessary to facilitate tile movement around the puzzle. The two middle rows did not rotate, further adding to the challenge.